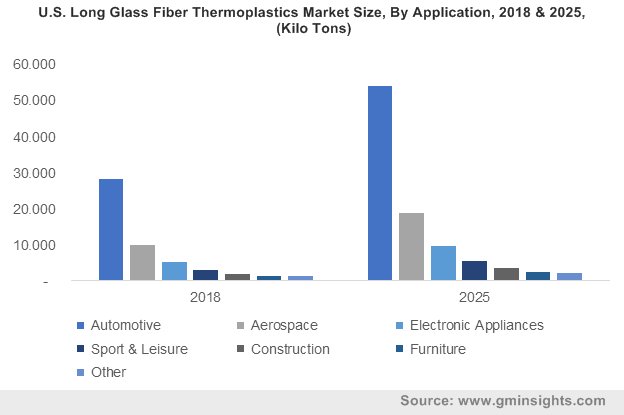 polyamide « Global Market Insights, Inc. Hot Melt Adhesives (HMA) Market is gaining considerable traction with growing need for high standard performance adhesives across various industries. HMA also known as hot glue, is a form of thermoplastic adhesive that provides optimal hold & superior manufacturing flexibility. In industrial applications, HMA provide several advantages over waterborne or solvent based adhesives. Some of the expectational benefits offered by HMA including longer shelf life, quick drying, increase throughput in production, and easy disposal have significantly driven the product demand. As of 2015, HMA industry stood at USD 5.5 billion and is projected to surpass USD 10 billion by 2024. According to Global Market Insights, Inc., the global hot melt adhesives market is foreseen to record an annual growth rate of more than 6% over the period of 2016-2024. Hot melt adhesives market will continue to expand at a rapid pace, as these adhesives address the ever-growing environmental concerns. The usage of HMA are favored by regulatory bodies as they are categorized as eco-friendly, VOC free, and safe thermoplastics suitable for storage, transportation, and production. The global hot melt adhesives industry is gaining high prominence in North America and Europe, as the product usage has received a green signal from the regulatory bodies such as REACH and EPA. With almost all the industries seeking more smart and competent solutions to manufacture and package goods, boost line speed, and reduce operational time, the HMA industry is witnessing a plethora of application scopes across myriad industries. Packaging represents a major end-use market for hot melt adhesives. Hot melt adhesives market share from the packaging application is expected to exceed USD 3 billion by 2024 and attain a CAGR of 5.5% over 2016-2024. The hot glues based with styrene block copolymer and amorphous poly-alpha olefins are widely used in hygiene products including adult incontinence, baby diapers, and female hygiene products. Hot melt adhesives industry size from disposable applications is projected to surpass a valuation of USD 1.6 million by 2024. Apart from this, HMA also finds usage in footwear, furniture, textiles, automobiles, and pressure sensitive products. APAC represents​ one of the fastest growing market for HMA. India and China are the prominent growth avenues in Asia Pacific, supported by robust infrastructure development and aggressive investments in the manufacturing sector. China hot melt adhesives industry share has witnessed a substantial raise, owing to strong demand from the furniture and the construction industry. This wide application scope has also stimulated the polyamide, EVA, and PUR based products. The EVA hot melt adhesives market is projected to generate revenue over USD 3.5 billion by 2024. Amorphous poly-alpha-olefin and EVA are two main product segments which are mainly used in automobile, paper industry, and woodworking applications. Amorphous poly-alpha-olefin hot melt adhesives industry is estimated to record a CAGR of 5% over 2016-2024. APAOs are used for repairing motorcycles, marine crafts, trucks, and cars on account of high resistance to moisture, chemical inertness, and UV protection. Europe, led by Germany hot melt adhesives market, is expected to record highest gains at an annual growth rate of 4.5% over 2016-2024. 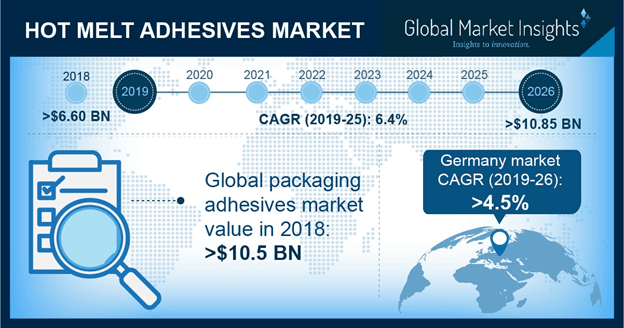 Escalating automotive industry, packaging, electronics, and textile industries in the region has provided a positive outlook for regional hot melt adhesives industry to flourish. Moreover, stringent regulation by EPA and REACH pertaining to the use of bio-based products has fueled HMA market growth. Globally, hot melt adhesives industry is quite consolidated in nature with companies such as Dow Chemical, 3M Company, Avery Dennison, Henkel, Sika AG, and H.B. Fuller accumulating significant industry share. This entry was posted in Polymers and Advanced Materials and tagged and polyolefin, Ethylene vinyl acetate (EVA), EVA hot melt adhesives market, Hot Melt Adhesives, Hot Melt Adhesives Market, Hot Melt Adhesives Market Analysis, Hot Melt Adhesives Market Forecast, Hot Melt Adhesives Market Future, Hot Melt Adhesives Market Growth, Hot Melt Adhesives Market Outlook, Hot Melt Adhesives Market PDF, Hot Melt Adhesives Market Price, Hot Melt Adhesives Market Report, Hot Melt Adhesives Market Share, Hot Melt Adhesives Market Size, Hot Melt Adhesives Market Trends, polyamide, Polyurethane, PU hot melt adhesives market, styrenic block copolymers.